This book offers 30 fun and easy art activities to express your hipster aesthetic. Each ready-to-color line drawing has plenty of space to add your own doodles, designs, and patterns. The book also provides sage advice on coloring and patterning techniques, plus some fully colored examples to get you started. Printed on high quality extra-thick paper, this inspiring coloring book for millennials is perfect for decorating with markers, colored pencils, gel pens, or watercolors. Designed to eliminate bleed-through, each page is pre-perforated for easy removal and display. Welcome to the Hipster Coloring Book! I d like to invite you to come inside and play with doodles, shapes, and patterns. Coloring and patterning are relaxing, meditative activities that encourage self-expression, sending you on a creative adventure. I hope that you ll use each of these pages as a launching pad to spark your creativity and unleash your inner artist. I took my first intercontinental plane ride before I learned to walk, and I've been hooked on travel ever since. From staying with a tribal village family in India to getting married under a tree in Australia, the world offers me such an amazing variety of experiences cultures to explore, places to see, differences to appreciate. Art is my way of assimilating and interpreting the world around us. And my travels allow me to keep my art and techniques fresh and interesting. From obsolete technologies to ironic facial hair, these light-hearted, tongue-in-cheek hipster memes are perfect for decorating with markers, colored pencils, gel pens, or watercolors. 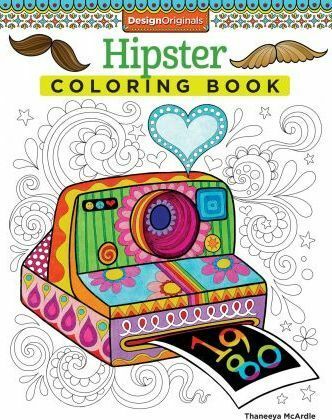 Hipster Coloring Book is printed on high-quality, extra-thick paper to eliminate bleed-through. Each page is pre-perforated for easy removal and display.